Harrods is the third most popular tourist attraction in London, after Buckingham Palace and St Paul’s Cathedral, with up to 300,000 visits on peak days. It has the highest proportion of customers from non-English speaking countries of any department store in London. Each year, Harrods publishes a range of catalogues and brochures as well as the exclusive in-house Magazine that brings alive all the latest trends in fashion, beauty and interiors. 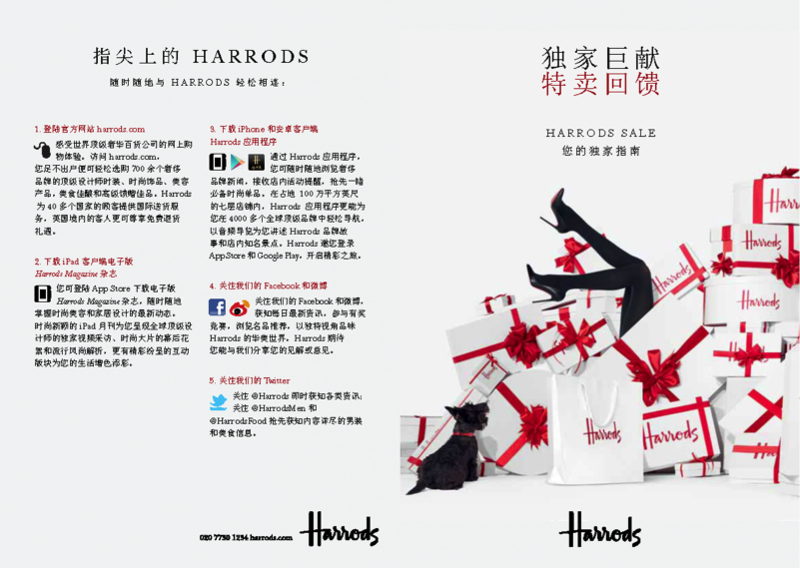 Due to their increasing popularity in the Chinese market, we’ve been helping Harrods to adapt all their marketing material since 2011 into up-to-date Simplified Chinese. This time we were briefed to adapt a sale flyer into Simplified Chinese. Our dedicated team of multilingual project managers in London briefed our expert creative translators and senior copywriters based in China to ensure that not only was all retail terminology translated with complete accuracy, but that the overall tone and messaging of the materials reflected Chinese local culture, while considering the level of awareness and knowledge of the UK market.